It was the first time I had to prepare my passport just to come home for dinner. But, it is a small price to have a “movie night” with two sitting U.S. Ambassadors. In honor of African-American history month, the first celebrated in Rome by two of our ambassadors both appointed by our first African-American President, the Lay Centre co-hosted a viewing of the PBS documentary, Legacy, with a discussion afterword led by U.S. 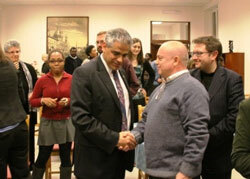 Ambassador to the Holy See, Dr. Miguel Diaz, and U.S. 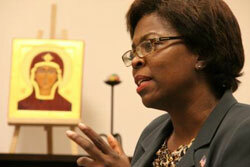 Ambassador to the U.N. Food Organizations in Rome, Ms. Ertharin Cousin. It was a change of pace from the theological, philosophical, and pastoral discussions that dominate the day, and the two Ambassadors made a good team, sharing from their personal experience and staying to answer a number of questions and facilitate discussion from a well-mixed audience of about 50 (the limit imposed by embassy security, apparently). In an age when the postmodern generations are facing the juxtaposition between a life of being told “you can be whatever you want to be” by parents, teachers,a nd society at large with a decade of economic crises and limited opportunity, even Ambassador Cousin’s son once commented to her, “how can we ever achieve more than your generation has achieved? There’s nothing left for us!” Echoing the generation across social and racial lines, the “entitlement” generation which was “promised” six-figure salaries straight out of college often cannot even get a job at McDonalds. How is that for disillusionment on a large scale? This is the new challenge – instead of trying to instill hope when adversity seems everywhere, how do you instill humility instead of entitlement? By A.J. Boyd in La vita Roma on February 22, 2010 .